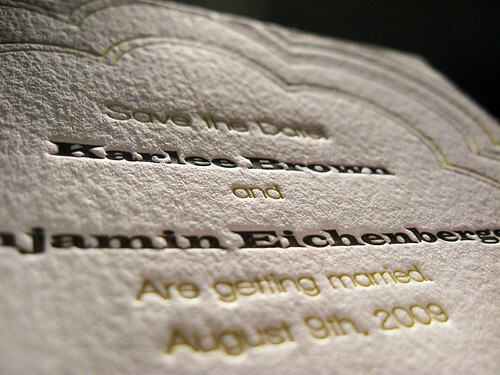 Our Valentine’s Day 2009 letterpress giveaway had some great engagement stories and when it came down to selecting a winner we had a hard time choosing. We picked high school sweethearts, Karlee & Benjamin, who had a great engagement story. 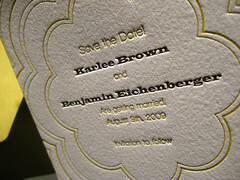 We printed their Save the Date cards this weekend and they turned out great … at least we think they did! The cards are printed on our 100% cotton paper (110#) using our vegetable oil based inks. 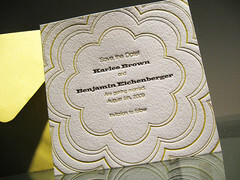 We custom mixed the chartreuse and chocolate brown ink and after a little work we had these great Save the Date cards. The scalloped circles look great pressed into the paper and we paired the Save the Date with a matching square chartreuse envelope to add a pop of color. 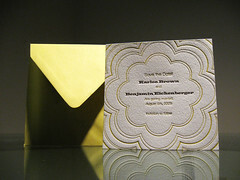 We’re very happy to have this design and several other new invitation sets added to our wedding portfolio.